In late December our new shop was graced with the presence of a new team member. With a Z-axis of 24” and weighing in at 10,000 lbs, “Woody,” our new Thermwood M70, brought some unique talents to our little enterprise. With a 10’ x 5’ envelope and a gantry that moves across the long axis of the envelope, Woody has increased our capacity for machining larger parts—as large as 10’x 25’ through the process of indexing. 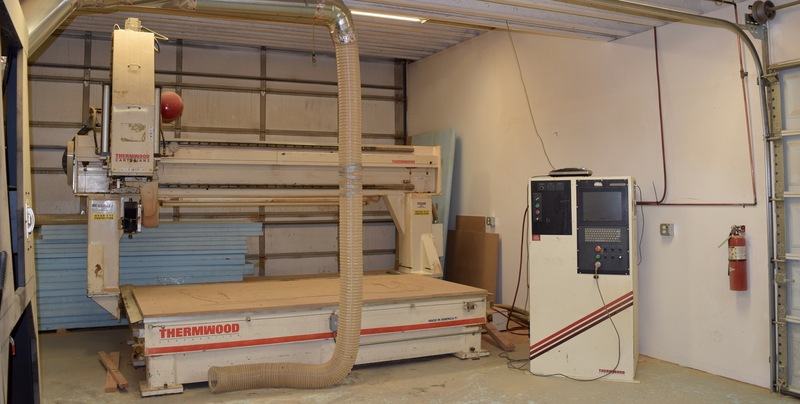 Not only is Woody bigger than our original CNC machine, but it is also faster and better overall. Woody is a continuous 5-axis machine, which means it can rotate around B and C-axes, as well as the usual X, Y, and Z-axes. This increased mobility of the machining head allows our Thermwood to cut a greater variety of surface types, as its rotational capacity enables it to machine undercut areas and swarf surfaces. Because this machine can cut bigger and deeper parts, this also results in higher quality parts—as using one machine to cut in a monolithic manner allows us to bypass the process of gluing individual layers together after cutting. This means inner and outer edges are much smoother and more accurate—requiring less sanding and surface prep as part of the finishing process. Another contributor to this improved accuracy is Woody’s ability to use shorter tools. Whereas some projects on a traditional 3-axis machine would require tools as long as 8”, Woody—because of its additional 2 axes—can use tools that are significantly shorter. These shorter tools are stiffer and therefore more stable, improving the part accuracy and overall quality. Contact us and let us know what Woody can do for you! Meet Woody! from Composite Approach on Vimeo.